I recently purchased a new seam ripper that blows my old seam ripper out of the water. In all fairness most any deluxe seam ripper would be better than the standard mini seam ripper that comes with all sewing machines. A couple of weeks ago I was reading Angela Walter’s blog and she posted about this fantastic seam ripper. 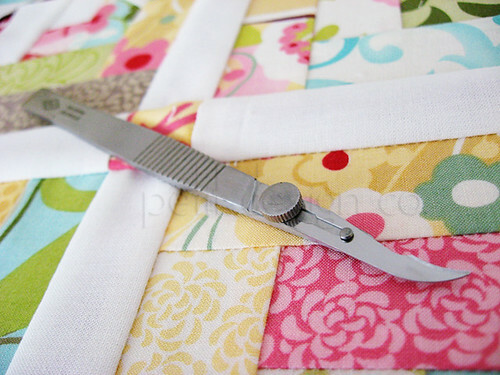 Knowing how much quilting experience she has, I decided to buy one of these seam rippers myself. I did some research and found the best price on Amazon. I paid $12.28 with free Prime shipping. The price has since changed and doesn’t have the free shipping but it’s currently $13.02 with shipping. This is still a better price than I found anywhere else. This is the price for the Ultra Pro II which includes 1 handle, 4 seam ripper blades and 2 button hole blades. Angela was right, this seam ripper is fantastic! It slices through seams with minimal effort. Like buttah! Yes it's super sharp (basically it's a scalpel) so if you're not careful you could poke a hole in your fabric. It works great for ripping out those tiny stitches. You only need to apply the slightest tension to the seam with one hand and then just barely touch the seam thread with the blade and those stitches pop right out. I also use the swing back friskars, they are great too,especially for arthritis hands. Thanks for sharing. I use an ergonomically correct, spongy ripper due to my hands, but I love the looks of this one. Thanks for sharing! I was wondering what other people thought of it.